Brendan's sister, Allison, has a tradition of creating beautiful crib quilts for each new baby shortly after his or her arrival. Each of our children have treasured their quilts which now reside on their big kid beds and often accompany them for a snuggle on the couch. 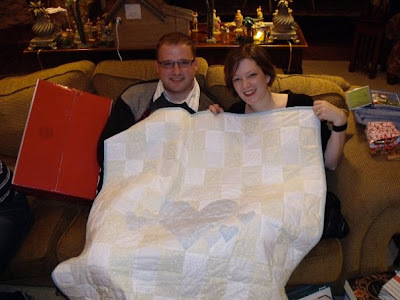 Allison has always wanted us to find out the gender of our expected baby so she would have an excuse to peruse patterns for their quilts, but we haven't ever given in to her requests. So Allison has been relegated to begin her sewing immediately after her newest niece or nephew makes his arrival. The day our sweet Henry Blaise was born was no different. Her grief compelled her to make her way to the fabric store that day to create the perfect quilt for the nephew she had lost too soon. Through many tears she has created for our family a beautiful coverlet of love which we will treasure always. She gave us this precious gift on Christmas Eve. The heart in the middle symbolizes Henry while the two hearts on the left symbolize Brendan and me. The four hearts to the right symbolize Henry's older sisters and brothers. Beautiful, indeed! Beautiful symbolism and a beautiful acknowledgement of Henry's place in your family. Nice work, Allison! Thinking of you as Jude's due date approaches (I was thinking it was the first of Feb., but my memory fails me.) Hoping you feel much movement from his baby sibling soon! Thank you Rachel. My official due date was February 3, also the Feast of Saint Blaise (not a coincidence, I'm sure of it!) I'm missing Jude, wishing he was about to arrive (I'm sure he wouldn't have made his appearance early!) and feeling hopeful for the life I carry today. Thank you for remembering. I knew you would.